Old Ahmedabad was referred as the walled city of Gujarat in India. The city was founded by Ahmed Shah one of the Mughal kings 1411. The city name has derived from the king. The East side of Sabarmati river is considered as the old city of Ahmedabad, the West side is the newly developed area of Ahmedabad. You can explore all the heritage style constructions on the east side. The Hindu, Islam, and Jain religion have played a major role in the rich heritage culture of the city. 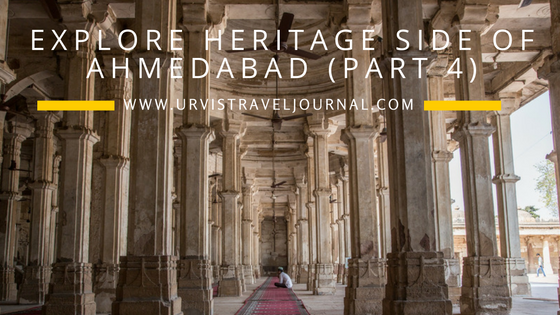 You can see detailed carving on the structure of temples as well as mosques.One of the best ways to explore this rich heritage of the city is to take a Heritage walk of Ahmedabad. Ahmedabad Municipal Corporation (AMC) has launched The Heritage Walk of Ahmedabad in association with CRUTA Foundation. The tour begins at sharp 8am with a slideshow at the picturesque Swaminarayan Mandir in Kalupur and runs until Jumma Masjid at the center of the city at 10:30am. Admission Fees:- It costs Rs 50 For Indians as well as SAARC Nationals, Rs 100 for Foreigners. There will be no stop for food & beverages, so better to bring a water bottle. You will not get anything during the Walk. During this walk, you will visit many temples as well as the mosque. So better to wear full pants as in some places they don’t allow you in shorts. Please do care of your footwear as, it will be required to remove it outside the Temple or Mosque. Ahmedabad offers a lot of heritage sites and you have to explore by yourself. There is plenty of transportation facility or you can rent a car. So first work out your itinerary, then start planning your trip. There will be two benefits of it. You will save time and money both. This Ashram also is known as Sabarmati Ashram. Mahatma Gandhi lived here for twelve years, so this ashram was one of the residences for him. During the visit, you will come across Mahatma Gandhi’s life Chronology and his achievements. They have kept “Charkha” in the Ashram as well. You can explore library, bookstore, and gallery to read more about Mahatma Gandhi’s life. I’m frequently to blogging and I also genuinely appreciate your posts. The article has truly peaks my interest. My goal would be to bookmark your site and sustain checking choosing details.